If you are in Australia and you haven’t tasted its seafood then you haven’t experienced the best of Australia. 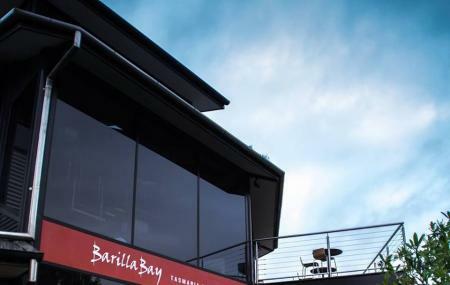 Barilla Bay Oyster Restaurant offers mouthwatering dishes made of fresh oyster. Want to try something different? Go for the fried Octopus with a variety of sauces. The restaurant has two floors and if you are coming here with your significant other, you can enjoy a romantic dinner on the second floor while gazing at the beautiful lights around the restaurant. The oysters come with different toppings. Choose your favorite one and enjoy the experience. Oomph up your visit by adding the best hotels in Cambridge like Rydges Hobart, Argyle Motor Lodge and Customs House Hotel. Curated Cambridge vacation packages await! Book the best ones and start turning your dream into reality.Discover various ways for how to reach Cambridge and complete the booking by choosing your mode of transport. Love this? Explore the entire list of places to visit in Cambridge before you plan your trip. Fancy a good night's sleep after a tiring day? Check out where to stay in Cambridge and book an accommodation of your choice. Great service and excellent food, especially the seafood platter for two! Wait staff could not have been more helpful in helping us with menu choices and checking to see if we needed anything more. Great experience! One of the best seafood restaurant in Hobart. Very nice place with plenty of parking spots. Friendly and helpful staff. I would like to revisit soon! This is the first stop after we arrived Hobart，it is literary less than 5 minutes by car from airport. Very fresh oysters and prawns. Price is similar everywhere, so go for it if you love oysters! Perfect. Son's wedding. Everything went like clockwork. The venue was great. The staff were very attentive without being intrusive. The meals delicious & servings generous. The comments have been very positive. Many guests have said how they will return to the restaurant. Kayla and staff are to be commended.